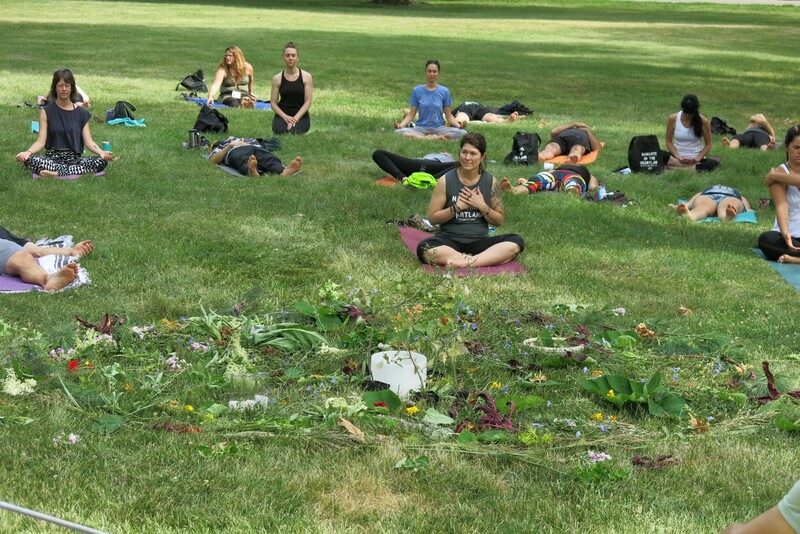 My next Adzenture Yoga Retreat is open for registration! Join me for my next grand adventure to BALI, Indonesia, November 5-12, 2019! Costa Rica Soul Revival~ An Epic Adventure! Costa Rica Soul Revival with Adzenture Retreats was everything. I am forever grateful to this unique mix of souls who gathered from all over to co-create this experience of a lifetime. We are forever bonded by this adventure. We went gliding through the rainforest canopy. We learned about the indigenous Bribri tribe and made our own chocolate from scratch. And we explored the surrounding towns with our new best adventure buds. All this excitement was balanced by a soul nourishing stay at our beautiful retreat center, The Goddess Garden. We feasted on delicious, locally sourced food. We practiced self-care with daily yoga and meditation in the stunning Yoga Shala. We woke with the sun. And we closed with gratitude. If you missed out on the Soul Revival, send me a quick email via the Contact tab to be added to the VIP list for my next retreat. You will be one of the first to know where we are going next and be eligible for sweet early bird discounts. So much gratitude to you, free spirits! Stay in the magical eco village, The Goddess Garden in Cahuita. Enjoy a dip in the pool… Or walk the beach just steps away from your room. And experience a traditional bonfire ceremony. If this opportunity has been knocking, now is the time to open up the door! Trust your deep intuition and start manifesting more adventure and world travel. Click HERE to snag one of the last spots! Our home away from home is right on the beach where solitude is just a short walk away. 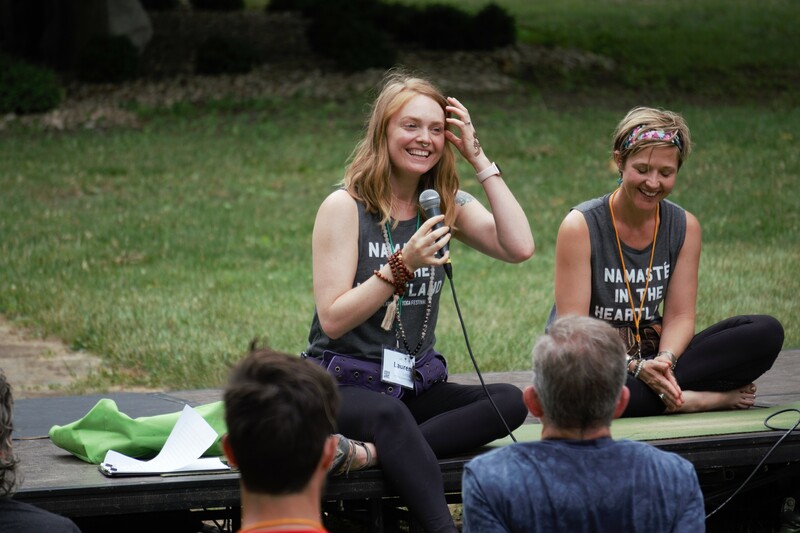 Your retreat includes daily yoga with me, including specialty workshops (I’m extra excited about our New Year Intention Setting workshop). All freshly prepared meals and coffee (most importantly) are included in your retreat package. Adventures include zip lining through the rainforest canopy, visiting the indigenous Bribri tribe to learn about their tradition of chocolate making, hiking through the jungle followed by a refreshing waterfall swim, and a traditional cacao ceremony around the bonfire. If you are feeling the pull to register, take the first step and answer the call of your deep intuition! That’s what this retreat is all about- peeling away layers of falsehood and fear to reveal our true essence of unity. This is an opportunity to connect to the innocent, wild, vibrant part of yourself that has always been and will always be. It’s a chance to steep yourself in the soulfulness of your yoga practice, to embrace your aliveness. All you need to do is show up for yourself with an open heart and mind. Take the plunge and register HERE! I can’t wait to explore the world with you! Costa Rica Yoga Retreat, Coming Soon! 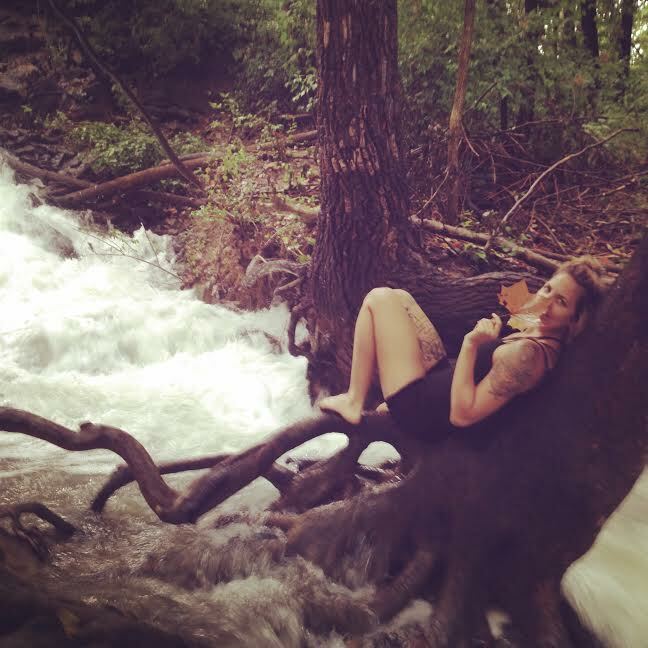 Friends, I am currently co-creating a magical adventure to COSTA RICA with my friends from Adzentures Retreats! Everything is still under wraps, but you can be one of the first to know all the juicy details. Follow the “Contact” link to send me a quick email so I can add you to my Early Bird list. Not only will you be on of the first to know all about it, you’ll have exclusive VIP access to pre-sale tickets! This wasn’t just the slogan for the first ever Heartland Yoga Festival, this was a mantra that we embodied as a community. We truly came together to unite in gratitude, play and love. Can you feel the reverberations of our intentions? 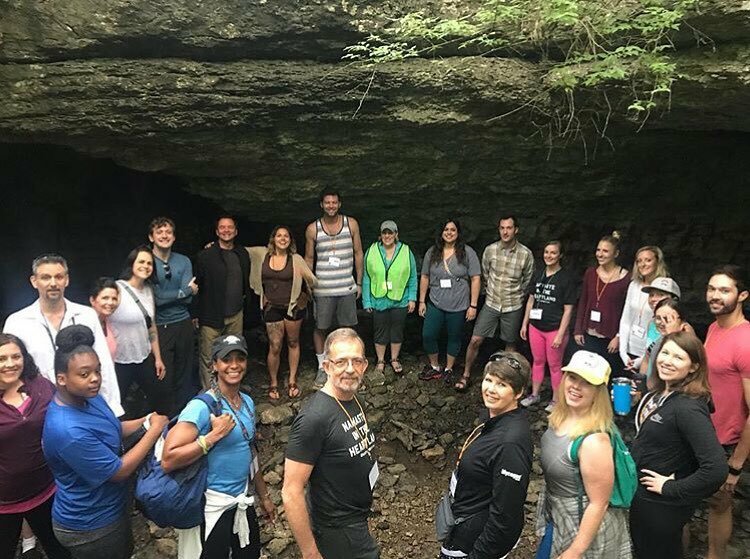 Yoga + Hiking, spelunking style. Tony Alvarez now has many adoring yogi fans after turning my class into a rock concert. Serious fun with Gina Caputo, Yogini on the Loose. Community art making moment led by Jamie Winter Dawson, you know I’m all about it. Queens Lauren Leduc of Karma Tribe Yoga and Angela Cronk of Hagoyah are the inspiring visionaries behind this whole shindig. THANK YOU COMMUNITY for making this ground breaking project a reality. For more amazing photos of the fest, visit Yogafolio. Happy Summer Solstice! 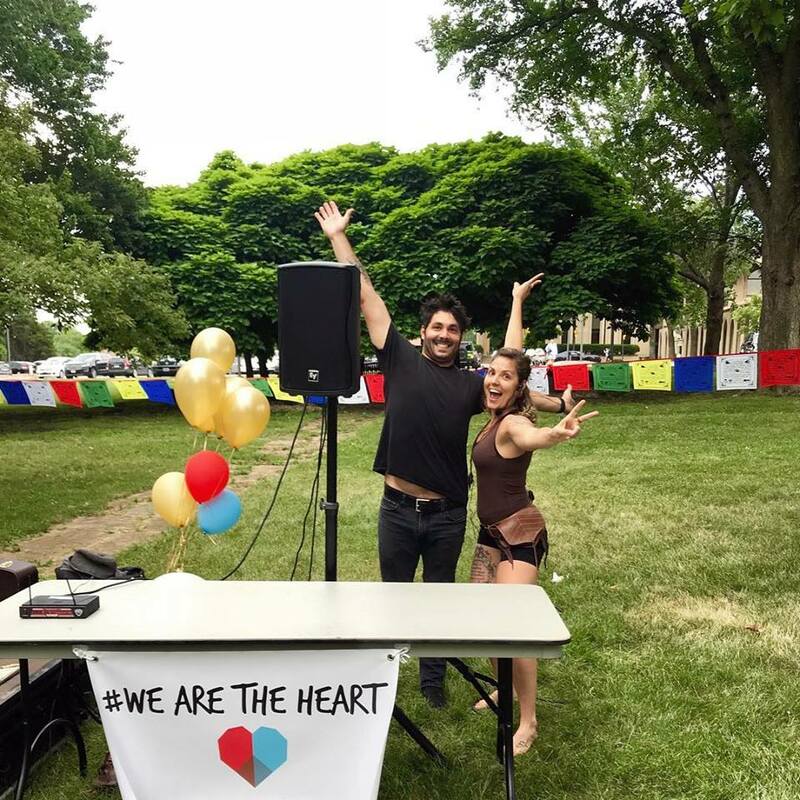 Celebrate with us at Heartland Yoga Festival this weekend, June 22-24 in Kansas City! 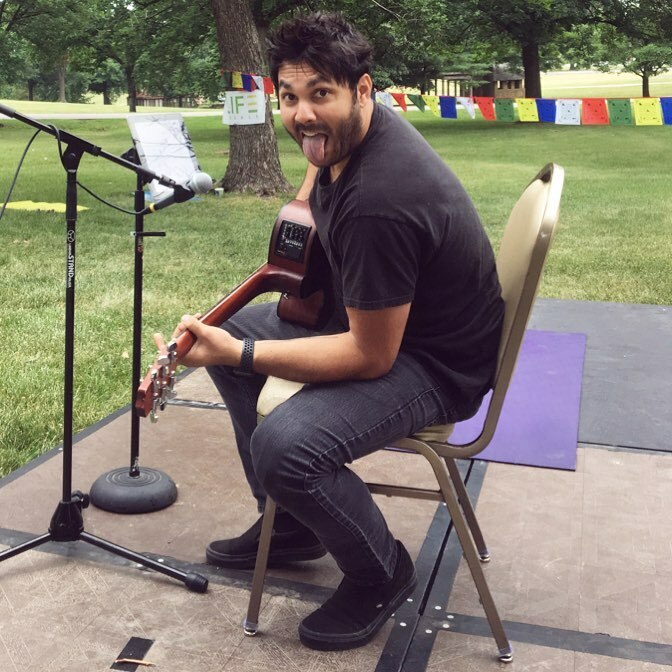 I will be leading a hike through the trails around Unity Village at 7am on Saturday the 23rd followed by community yoga with live music by Tony Alvarez at 8am! If you are unfamiliar with the intention behind this movement, no one says it better than the founders themselves. You and I…we are the heart. The vital essence. The center of love and compassion. The vitality of this land. Within this heart is a quickening. It started as a whisper and will crescendo to a wild roar. Our time of disconnection is over. We’ve had enough of staring at our phones instead of looking into the eyes of our neighbors. We are done with being detached from Mother Earth. We are done being so busy that we forget to live. There is no more hiding our pain and self-criticism. There is no more illusion, no more pretending. The time to communally awaken to our beautifully connected souls is right here and right now. In the open heart of this country. This is the Heartland. Where it’s still cool to be a good neighbor and to smile at strangers. Where ego doesn’t shake authenticity. Where we support local, and tend to the Earth with loving care. Where all it takes is a simple reason and a beautiful day to come together in celebration. Where community always trumps competition.Where we all belong. A place of great pride. 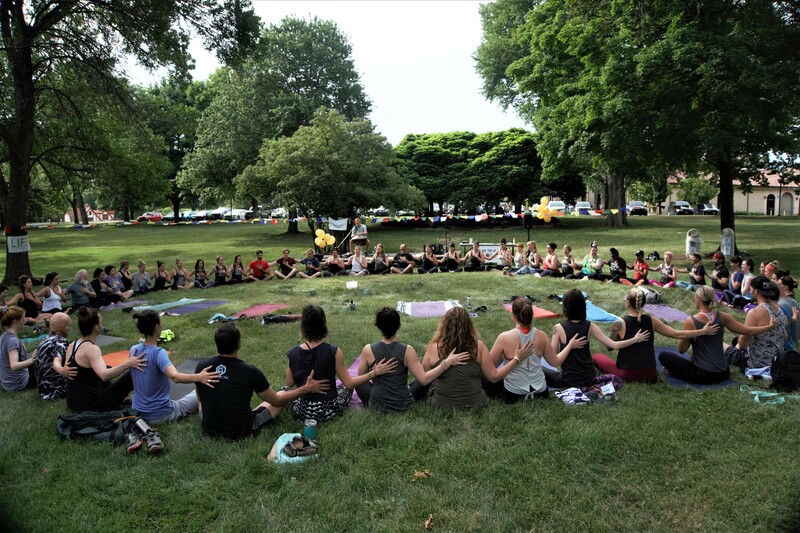 As we unite for Heartland Yoga Festival, through our connection, our shared breath, our authenticity, wildness, and utter unabashed delight, we will send a pulsing vibration of love and light. A positive charge so big that it will bleed beyond our borders, radiating outward, penetrating and changing all beings for the highest good. YOUR heart, breath, and light are vitally important. Join us as we shift into a space of love, connection, and radical self and communal care. We are the heart and this is the Heartland. See you this weekend, friends.